» A private push to build a short line down Woodward may find itself in official plans once again. Just three weeks after Detroit leaders announced that they had abandoned efforts to build a 9.3-mile light rail line down Woodward Avenue, the city’s central strip, Mayor Dave Bing revealed on Friday that he would allow a shorter link funded by a private group to move forward if it submitted an acceptable business plan within 90 days. The project will have to be built right: Even at just 3.4 miles, the line could serve as a quick, reliable connector between the waterfront and the New Center, via Midtown, but that will only be possible if trains run in their own lanes, if they run frequently, and if they are funded with no negative effect on the city’s already under-financed bus system. There is evidence that those conditions will not be met. Yet the project’s design has yet to be completed — Detroit transportation advocates could successfully fight for the appropriate implementation of this first stage of Woodward Light Rail. But the circumstances in which the project’s reactivation has occurred speak to a continued dysfunction not only in the City of Detroit but in American transportation politics in general. The rail project was put on hold last month because of the sense that the City of Detroit — already mired in debt — would be unable to afford the operations costs of the corridor (estimated at $10 million a year) without sacrificing bus service. Repeated plans for a regional transportation authority, and associated funding, have been in the air for decades. Only a plan that served the suburbs well would be acceptable, since they would have to agree to increasing financing for transit, and so Governor Rick Snyder, Mayor Bing, and U.S. Transportation Secretary Ray LaHood agreed to refocus efforts and money on city-suburban improvements to the bus network. The latest move is backtracking at its best. Seemingly overwhelmed by calls from influential congressmen and the executives of downtown businesses like Quicken, Penske, and Compuware, who have already lined up $80 million for a $125 million short version of the line (which they call M1-Rail and which was actually proposed in advance of the longer corridor), the deal from last month will be amended. That is, if business leaders are able to find an effective way to cover the remainder of the capital costs and provide for the continued operations of the line, which they have said they could pay for through a tax-increment financing (TIF) district. They also want to take back the $25 million TIGER grant promised by LaHood in early 2010, then pulled back in December. Why the sudden change in prospects for the line? Why weren’t these investors — willing to put up a surprising amount of money — consulted before their project was abandoned? What assurances do we have from the mayor and governor that suburban interests won’t be yet again frustrated by the fact that Detroit gets rail and they get rapid buses — and veto a regional transit authority? Where is the communication and where is the consistency in policymaking? Just as we have seen with the Obama Administration’s high speed rail program, or New Jersey’s ARC rail tunnel, or a variety of maglev projects, this country specializes in spending years studying projects, then partially funding them, then effectively abandoning them. This results in years of delays and extra spending. I have been clear in the past that the Woodward rail line is a questionable priority for the region, but the move back and forth on decisions helps no one. Downtown Detroit’s leaders have been waiting patiently for the rail line, planning ahead around its development; were they forced to reconsider their options last month? Now what do they do? There is nothing clear, after all, about the future of this project. Nonetheless, the line does show some promise, because if Detroit is going to grow at all (it lost more than 230,000 people between 2000 and 2010), it will be in the small area bordered by the Chrysler and Lodge Freeways on the east and west, by Grand Boulevard and the waterfront on the north and south — and that’s exactly the neighborhood the short light rail line is supposed to serve. 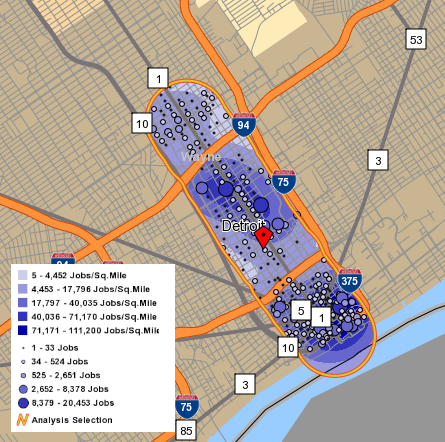 In that area, within 1/2 a mile of the Woodward corridor, are already 123,000 jobs (map of employment density in corridor) and about 20,000 residents, according to the U.S. Census. Most of the city’s major cultural institutions, including Wayne State University, the sports stadiums, and several casinos, are within walking distance. Connections will be possible not only with the existing bus lines and Amtrak but also with the new BRT services proposed by Governor Rick Snyder last month, meant to link Detroit with the suburbs and the airport, via Michigan, Woodward, and Gratiot Avenues. As I referenced at the start of the article, however, a light rail line within this area could be an appropriate addition to the transportation landscape of the city — or it could be the second coming of the much-maligned People Mover, which makes a quarter-mile-radius circle in one direction downtown. That system attracts few riders. But the Woodward corridor, serving real trip needs, could work — under certain conditions. Light rail vehicles must be designed to run in their own lanes and be able to take advantage of traffic signal prioritization to ensure that they make the journey between destinations quickly. But the M1 group has been adamant that trains run next to the sidewalk in shared lanes to “boost tourism and redevelopment.” I was not informed that tourists and developers were particularly enamored of slow trains that have the propensity of being stuck in traffic. Meanwhile, such a short corridor must feature trains running very frequently. While many of the riders will be residents commuting to and from work, a significant share is likely to be made up of people transferring from other transit modes and of people who drove into work and need a downtown circulator. For the latter groups, waiting more than five minutes for a train in the middle of the day would represent a significant impediment to using the system, as they have other options, such as walking or buses. But the tenuous nature of financing for transit in metropolitan Detroit suggests that it will not be easy to fund such services, even if a TIF district is established. Once it becomes clear that the light rail line hasn’t solved the city’s woes, can we be sure that the business lobby won’t switch its interests to funding parks or other amenities? For the sake of the city’s bus system and its future BRT network, operations funding for the light rail project cannot be derived from expenditures meant to be devoted elsewhere, such as from the proposed regional transit authority, as Mayor Bing and Governor Snyder have already made clear. Making it over this hurdle will be difficult. Within ninety days, the city should make a very clear, final decision about its interests in the future of the Woodward Corridor, giving the M1 group a definitive answer about the future of the light rail line. The rail project should be built only if it can be funded without affecting bus financing and provide excellent transit service downtown. No more dilly-dallying. ‘The rail project should be built only if it can be funded without affecting bus financing and provide excellent transit service downtown.’ Neither of the 2 latter specifications are going to be met. But no worries, Yonah; this project is never, ever going to happen. The ongoing fantasy of Woodward rail exists solely to keep transit bloggers and local reporters busy discussing the hypotheticals. That’s no slam against your writing, just an honest assessment of this project’s (lack of) future. What needs to happen first is that the Republican state legislature and Gov. Snyder pass legislation enabling the creation of a regional transit authority. If that doesn’t happen, there’s no way we’re going to get federal support for the project, which is why i’m optimistic given that Snyder has already come out in favor of the RTA. Next, the various bus systems, light rail, people mover, need to be consolidated under one system. One card that can be swiped anywhere. Part of the reason that transit is such a terrible option in Detroit is that simply navigating the system is ridiculous. Getting a monthly pass to ride buses requires two purchases that can only be made in downtown Detroit or downtown Royal Oak, or by mail. Buses don’t tell you where they go and they have routes that don’t make sense. If the hypothetical RTA could fix that, transit would make a giant step toward being a viable option for downtown residents and workers. Synder’s a tyrant, but he’s not an idiot. I was discussing this recently. Snyder is dismantling local governments, breaking contracts, squeezing the poor, and giving away valuable assets to his buddies. Just like Scott Walker. But the difference is, Walker is *stupid*, and alienated everyone at once. Snyder is making sure to abuse only a relatively small number at a time, while continuing to back popular, sensible projects which will make others happy. What needs to happen is that Detroit needs to have a tax base. Pretty much the vast majority of the tax base that it used to have has fled to the ‘burbs, which have little interest in recapitalizing the city of Detroit (and may well consider it a good thing that the vast majority of the region’s poor are economically segregated within a separate municipality). Any regional transit authority would draw from at least Wayne, Macomb, Oakland counties. Detroit may not have a tax base but the metro area itself is not poor. A half a cent sales tax would probably do the trick, and the sales tax rate would still be less than that of neighboring cities. The other counties do have a lot to fear to close the water tight doors to keep their section of the regional ship from sinking. If I where a county and a bankrupt place as large as that city wanted me to give them tax dollars for transit I would be very scard. I’m not at all sure how a streetcal line will do as far as ridership is concerned but it almost certainly will be helped by not being a one-way loop like the DPM. I’ve never understood the logic behind making the DPM that way but there has been at least a time or two when a section’s been shut down for a building demolition or other reason which coud’ve been an opportunity to put in a siding or two on the closed segment. It certainly wouldn’t have cure all the DPM’s problems but wouldn’t have made anything worse. In fact it would’ve been at least a little bit of help. I’m surpsed they haven’t thought of extending the people mover to at least allow it to go to more places on the line. The Detroit People Mover as we see it, today, was a PART of a much larger city-wde system, and because the federal government program that help build the system was discontinued, all we got was the downtown circular ring portion of the system. As is the case, now, the city didn’t have the capital to actually build the rest of the system (few cities do). Ironically enough, even this downsized street car/tram might actually increase the PM ridership in that it’s now being touted as a way to bring people from the Amtrak station – which is about to be one of the stops for the SEMCOG Commuter Rail, a project very much on its way to completion – to downtown. So, now, you’ll actually be conecting rail commuters with a tiny, inner-city system of a tram and people mover, but you’ll find have an all-rail city center system cutting out buses, which even if they aren’t any worse than the tram, still have a stigma. Honestly, others have said it, but if they REALLY want to do something with transit in Detroit, the GOP legislature HAS to allow for the creation of a regional transportation authority (only they can do that), and they’ve already all but said it’s not something on their agenda, now or never. Detroit got the People Mover because Cleveland didn’t proceed with it. Cleveland had the project to function as a distributor from Terminal Tower to the rest of downtown, like Metromover in Miami. Cleveland was/is the only city in the country with only one downtown station on its rapid transit system (and the Waterfront Line doesn’t count, since it’s out of regular service due to lack of demand). Detroit’s difficulties with some form of rail on Woodward are reminiscent of the saga of Cleveland’s Euclid corridor. Cleveland got a very expensive busway because the Feds refused to fund a rail project–despite proposed connection with the Shaker lines–and then put the kibosh on trolleybuses. Detroit and Cleveland have collapsed, but they’re not dead yet. In both cities, there’s more than a spark of life along that primary arterial. In both cities, you’d never know if planning officials had ever taken a look at current or historic transit service, not least because they work overtime to provide as many “safe” parking spaces as any SUV-driving suburbanite could ever want. I would expect it to happen in Detroit before Cleveland, but I’m really beginning to believe that the unstated but implicit plan in each state is to let things get so bad that basic public services in both cities are shut down by the state and contracted out to the whims of whatever private contractor is the most connected at the moment. I truly hope that the private investors can be convinced to work with the city of Detroit for the best plan, because there aren’t any good alternative scenarios. I can’t think of another city in the US which is the target of such overt hatred from a state legislature or the general public. Michiganders are strangely incapable of acknowledging that Troy and Rochester Hills (and all the other suburbs in Southeast Michigan) exist only because there is a Detroit, and that’s the only reason they were ever anything more than farming hamlets. You kill Detroit, you kill its suburbs too. Probably. That’s what Synder’s tyrannical “Emergency Managers” are all about. The thing is, I don’t think the private contractors are going to bite. In Benton Harbor, they had their eyes set on a park, which they wanted to steal. I don’t see what there is to steal from Detroit at this point. Public services are not profitable, and trying to price-gouge poor Detroit citizens will just lead to increased exodus. The constellation of interests behind M-1 seems pretty serious. I’d say go with it. At the very least, you know that the companies whose executives are personally backing the streetcar line, will do whatever they can to get their employees to use it. Perhaps up to and including building company housing for them. I have to be very skeptical of a three-mile rail line as it just forces a transfer for a lot of people (so that the bus lines aren’t duplicating the rail line). It’s better to send the buses downtown — and forget about rail — unless you physically can’t fit any more buses into the downtown and they’re all overcrowded. Only then would you truly need the high capacity of a rail vehicle and justify forcing thousands of people to transfer. The buses aren’t on time. As someone else said, this is going to serve as a distributor for people from the Amtrak Station. In times of economical difficulty, uncertainty as to the demand of the LRT and other issues, why not think of a BRT (Bus Rapid Transit) instead….it costs a lot less and will be more suitable for a city full of uncertainties. BRT costs a lot more than LRT, actually. For the same quality it costs more; and for lower quality, it costs more once operations are figured in. There is an argument that crappy buses are more suitable for a city which may be shutting down. To clarify, a so-called “BRT” system of faster buses is the City’s plan. Which is unrelated to the private M-1 funders’ plan for a streetcar from Grand Ave via the Amtrak station to downtown. Why don’t they just do a light rail down woodward til 8 mile or so. Eliminate all buses that go essentially north and south and just go east and west down about 10 routes all day long. If you need to go north you connect at the light rail. That would save a ton of money. From what I’ve read in the news, the city would prefer to spend money on an extensive system of faster buses and decided it couldn’t afford to do BOTH that and build the light rail (Detroit has some serious money problems, obviously). The private funders agree with you and disagree with the city, so they’re building the part they can fund privately, from downtown to Grand. After that gets built we’ll see if it gets extended. I tend to agree with you too, because a lot of urban economics analysts say that Detroit can’t afford to be this spread out, and really needs to remove streets & utilities from some neighborhoods to concentrate services in a few “healthier” corridors. But Detroit is still going for broad coverage, even though it’s unaffordable at the current population levels.